In 1990, WAAL established a scholarship in the name of the late W. Dale Phillips to provide scholarships to African-American law students at Wisconsin’s two law schools--Marquette University Law School and the University of Wisconsin Wisconsin Law School. In 2004, WAAL proudly renamed the scholarship the VelanDale Scholarship Award to include, and honor Vel Phillips' outstanding accomplishments. 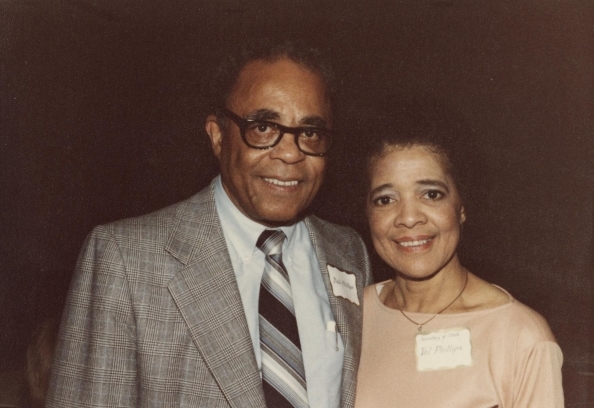 Vel Phillips passed away in 2018 and Dale in 1988, but their community work, activism, public service, and legacy will live on forever. WAAL is proud to continue the Phillips' legacy by awarding law students with the VelanDale Scholarship, the Hon. Maxine A. White Book Scholarship, and the Hon. Charles N. Clevert, Jr. Scholarship. W. Dale Phillips was born in Omaha, Nebraska on 1922. He received his Bachelor of Science Degree from the University of Wisconsin-Madison in 1946. He went on to obtain his Doctor of Jurisprudence from the University of Wisconsin-Madison in 1950. Dale Phillips, with his wife, Vel Phillips, became the first husband and wife partnership admitted to the United States, Eastern District of Wisconsin. In 1951, Dale and Vel Phillips opened up the law practice of Phillips & Phillips in Milwaukee. Dale was an active member of numerous organizations and associations, including the Black Lawyers Association, State Bar of Wisconsin, Boys Club of America and Alpha Phi Alpha Fraternity and he also served as President of the Milwaukee Chapter and Wisconsin State Chapter of the NAACP. Dale Phillips passed away in 1988. Velvalea Rodgers "Vel" Phillips was born in Milwaukee, Wisconsin on February 18, 1923. She graduated from North Division High School and went on to Howard University to get her Bachelor of Arts degree in 1946. Vel Phillips went on to become a woman of many firsts. In 1951, she graduated from the University of Wisconsin Law School becoming the first African-American woman to do so. With her husband, Dale Phillips, they became the first husband and wife partnership admitted to the United States Eastern District of Wisconsin. In 1956, she was the first woman and first African-American elected to the Milwaukee Common Council. She was later appointed to Milwaukee County Circuit Court becoming the first woman judge in Milwaukee County and the first African-American judge in Wisconsin. In 1978, she became the first woman elected to the office of the Secretary of State. A community activist, public servant, and trailblazer, Vel Phillips' career and legacy inspires generations of attorneys. Vel Phillips passed away in April 2018 at 94 years old. Click here if you are unable to watch the above video.